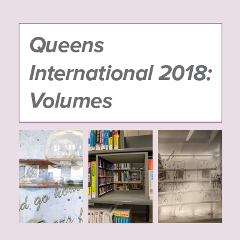 Queens International 2018: Volumes (QI 2018) opened at the Queens Museum in October, and on Saturday, November 10, for the first time ever, the Queens International extended offsite, with art installations in three Queens Library branches: Lefrak City, Flushing, and Central Library in Jamaica. Since it began in 2002, the Queens Museum’s Queens International has highlighted the artistic production of Queens in a major biennial group exhibition. This year, artists Patrick Killoran, Paolo Javier, David Mason, and Mo Kong will bring their unique vision to our libraries.